The global inflammatory bowel disease treatment market is expected to witness an escalating graph of competition over the forthcoming years. The established market players have been on a quest to penetrate into local markets to expand their geographical reach and outdo their competitors. Since the market is connected to the healthcare industry, governments and healthcare bodies also play a key role in ascertaining the growth trajectory of the market and market players. The leading market players have invested in core research and development over the past and are expected to continue this trend over the forthcoming years as well. It is apparent that the ability to develop novel drugs and therapies would play a pivotal role in deciding the fate of each of the market players. Furthermore, with a larger number of products gets clinical approvals, new entrants have garnered a sustainable market share. The leading market players are expected to acquire smaller players for dual reasons; first, to outdo competition, and secondly, to expand their global reach. Furthermore, the competition in the market is expected to intensify over the coming years due to ardent business strategies of all sizes of companies operating in the market. Some of the key market players are Valeant Pharmaceuticals International, Inc., Novartis AG, and Allergan plc. TMR estimates that the global market for inflammatory bowel disease would expand at a sluggish CAGR of 2.60% over the period between 2017 and 2025. The slow growth rate could be attributed to the low incidence of inflammatory bowel disease on a global scale. TMR finds that the market was valued at US$10.52 bn in 2016 and is expected to experience a moderate increase to reach US$14.83 bn by 2025-end. It was found that the growth rate in the North American market outdid all other regional segments in 2016 due to a relatively higher incidence of Crohn’s disease in US and Canada as against other countries. Based on the class of drugs, the key segments of the global inflammatory bowel disease treatment market are aminosalicyclates, corticosteroids, immunomodulators, and TNF inhibitors. Amongst these, the TNF inhibitors are in great demand due to their swift and effective action towards relieving inflammation in the bowel. Some of the most commonly used TNF inhibitors include infliximab, adalimumab, and vedolizumab. It is anticipated that the segment of TNF inhibitors would keep garnering a greater market share over the forthcoming years. There have been rapid advancements with regards to the development of therapeutics for inflammatory bowel diseases, which is expected to give an impetus to the growth of the global market. However, the easy availability of copied drugs that are similar in properties and therapeutic action as the original drug has hindered the growth of the market. Johnson and Johnson’s Remicade and AbbVie’s Humira are two of the drugs whose copies are available in the market. 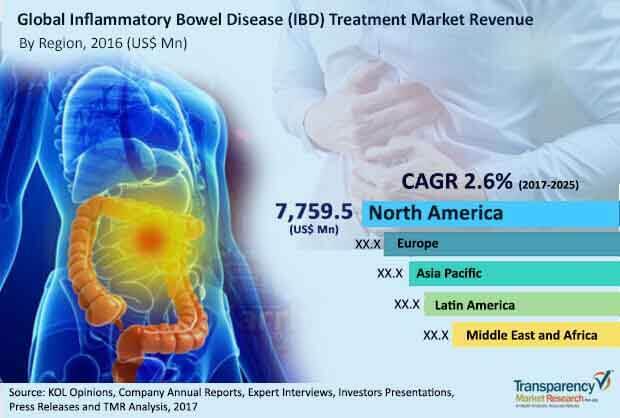 Nevertheless, the efforts of the market players to promote their products are expected to keep pushing the growth of the global market for inflammatory bowel disease treatment market.